Christ Church Meadow; hawthorn blooming by the Thames in late April 2017 (photo Tim Healey). It is rare for the flowers to blossom ahead of May Day, but 2017 was an unusual year - see below. 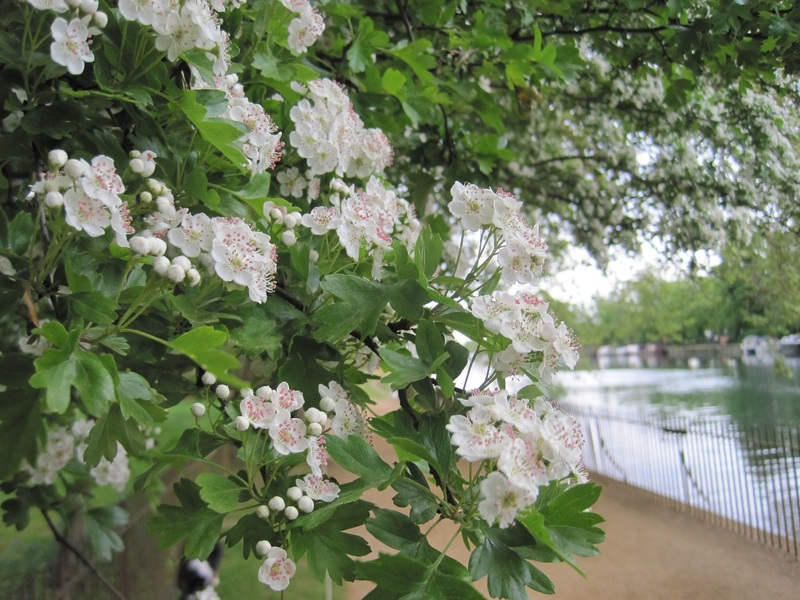 Hawthorn or 'May' (Crataegus monogyna) is rarely in flower on the First of May - it generally blooms closer to the middle of the month. But the 'May-tree' did flower reliably at the beginning of May in mediaeval times when many folk traditions were first formulated. The blossoming date was changed by the introduction of the Gregorian calendar in 1752 when eleven days were taken out of the month of September. Subsequently, 1 May was tugged back to what had formerly been 20 April. Despite all that, 2017 turned out to be a freak year for blossom, with many plants and trees flowering well ahead of schedule. Global warming? 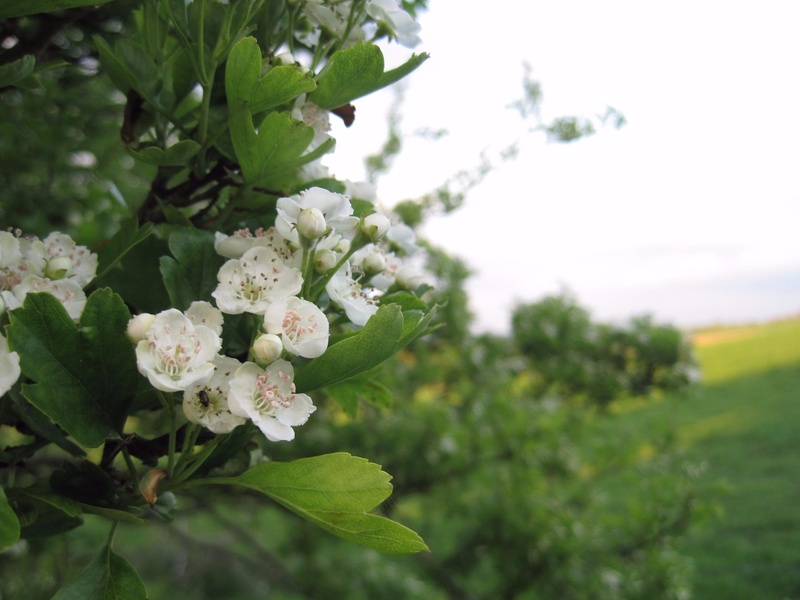 Whatever the reason, a mild winter led to smatterings of May blossom appearing in Oxfordshire hedgerows as early as mid April - and whole trees blooming in good time for May Eve. When in season, hawthorn hedges smothered in white and pink blossom would have been the most spectacular features of the landscape. So, 'Bringing in the May' typically meant bringing in branches of hawthorn. The term ‘May’ could, however, be used more generally for any greenery brought in to deck houses – plum, sycamore and birch were also favoured in some parts of Britain. There were even traditions by which plants were brought in and hung as insults on people’s doors; elder, nettle or thistle, for example, for the scold or the slattern. Hawthorn is ubiquitous in Oxfordshire, growing as readily on the chalk uplands of White Horse Hill as in the water meadows of the Windrush at Minster Lovell. For country folk its greatest practical use was as a hedging plant. The word comes from the Anglo Saxon Hagathorn where Haga means hedge. Alternative names include whitethorn and ‘quickthorn’. Quick means living (as in ‘the quick and the dead’). Villagers could enclose a patch of land by ‘quickset hedging’ or setting live cuttings directly in the earth where they would grow to form a dense barrier. The fruits, flowers and leaves of the hawthorn have medicinal uses known throughout western Europe since the 17th century. 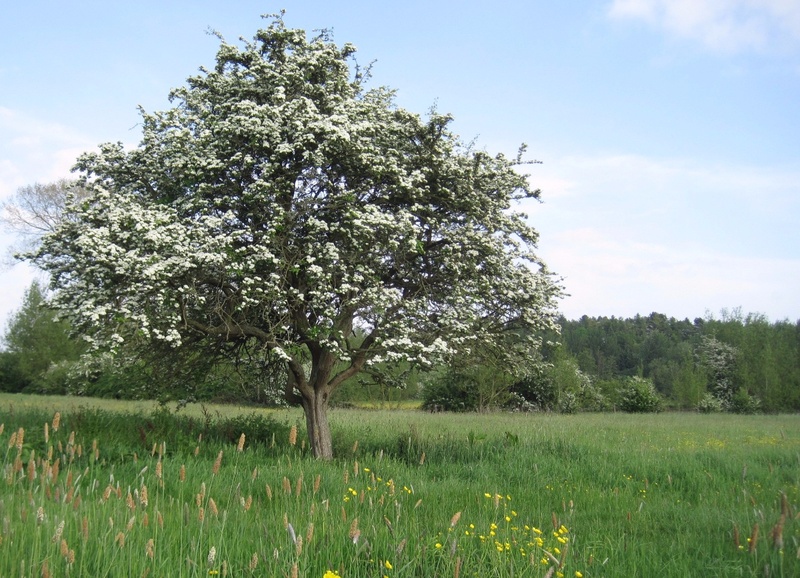 Doctors prescribe hawthorn chiefly for heart problems and cardiovascular disease. Extracts are processed into tinctures, tablets and capsules. The leaves and leaf-buds of young hawthorns can be eaten straight from the tree. In country districts they were known as 'bread-and-cheese', and supplied welcome fare in times of hardship or famine. Fruits ripen in autumn to red berries called 'haws' which are used for making jellies, jam and 'Hawthorn Brandy'. In centuries past, people associated the smell of hawthorn blossom with the odour of death. In Maytime you might deck the outsides of houses with branches, but there was a taboo against bringing them into the home. 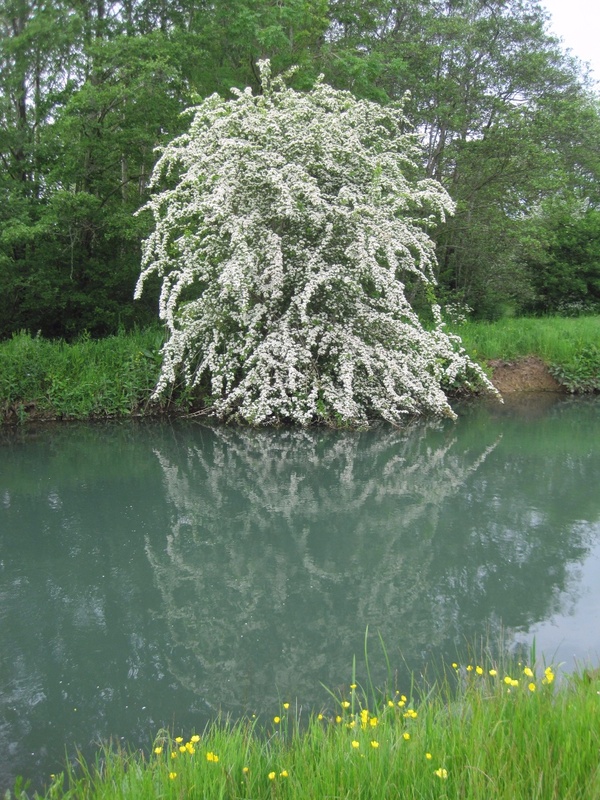 Botanists have since discovered that the chemical trimethylamine present in hawthorn blossom is also one of the first chemicals formed in decaying animal tissue. In bygone times, when corpses were kept in homes for several days prior to burial, people would have been all too familiar with the smell of death. Small wonder that hawthorn blossom was unwelcome inside the house. If it is allowed to grow freely, hawthorn will become a tree of around 10 metres. Such isolated trees are often revered in local folk tradition where they are said to be inhabited by faeries. A solitary May-tree should not be cut down or damaged for fear of incurring the wrath of its guardian spirits. 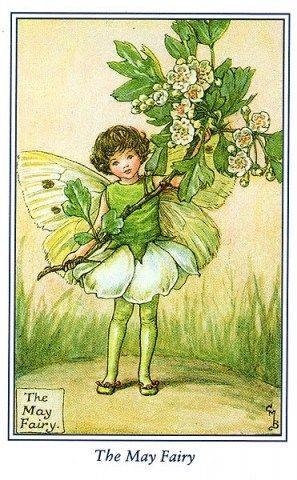 There are many tales about people who encounter faery folk beneath a hawthorn - or fall asleep beneath one - and are transported to the otherworld, not returning for some time.